Marlene Armstrong always knew horses were very special beings who could heal your soul and help you lead your best life. Owner of Foxview Stables Inc., a horse training facility, Marlene offers Equus coaching to teams, executives and individuals in partnership with Maureen Donoghue via Unbridled Coaching – People WhisperingTM. A Certified Equus CoachTM, Marlene has over 35 years’ experience in project management, leading inter-disciplinary teams, organizing major events, coaching and team building. 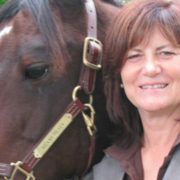 Marlene loves to work collaboratively and invites all Equus Coaches wishing to assist in her workshops to contact her. She is also keen to provide her services elsewhere in the world. Marlene’s passion to help her clients reach their full potential and to find their ‘true self’ is unsurpassed.